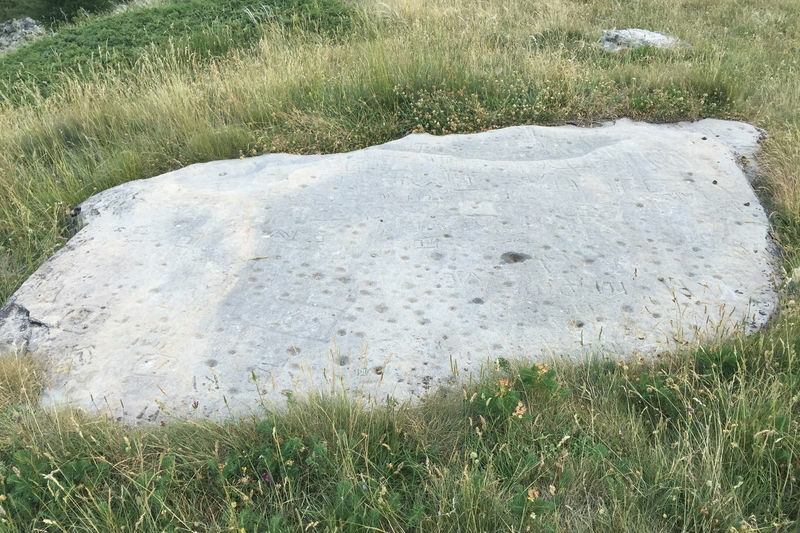 Prehistoric stones with cup marks are common in the Alps. The stones and rock carvings at Hubelwäng in Zermatt are listed as archaeological objects on the Federal Inventory of Swiss Heritage Sites of national importance (ISOS). One of the ten stones lies beside the Herbrigg–Zmutt path and measures 4.60 m by 2.80 m. It looks as if it were installed in the meadow as a paving slab; locals call it the “Heidenplatte”, or “pagan stone”. Hans Liniger (see “Reading”) suggests that the hollows, the size of golf balls, were used in prehistoric times to obtain rock dust for medicinal use. The stone also displays Neolithic petroglyphs. Later, other symbols such as monograms were carved into the rock. “Basler Beiträge zu den Felsbildproblemen”, supplement 1/1978, Prähistorische Schalen- und Bildsteine ob Zermatt und Zmutt, Hans Liniger, Basel.